The College of Business Administration at Maharishi University of Management develops business leaders and professionals with the consciousness, knowledge, and practical skills to create sustainable value-producing, life-supporting rewards and benefits for themselves, their stakeholders and the natural environment and to help students develop the knowledge, creativity, and organizing power to be successful in a dynamic, ever-changing, business environment. Through the Departments of Management and Accounting, the College offers a Bachelor of Arts in Business Administration, a Master of Business Administration, and a PhD in Management. Each of these degree programs is oriented toward the achievement of specific student learning outcomes through active learning projects that take the student into the real world of business. The bachelor’s program develops the knowledge needed by an entrepreneur and culminates in the presentation of a business plan developed by the student. In the MBA program, students apply their knowledge to improve the performance of an organization through a specialization in sustainable business with options for additional specialization in business process improvement, accounting, and human resource development. The PhD in Management prepares researchers who can enrich the understanding and practice of sustainable business with new knowledge about the highest levels of performance for the individual, the team, and the organization as a whole. All of these programs are taught in the light of Maharishi Vedic Management — the knowledge of the total intelligence of nature and its organizing power. 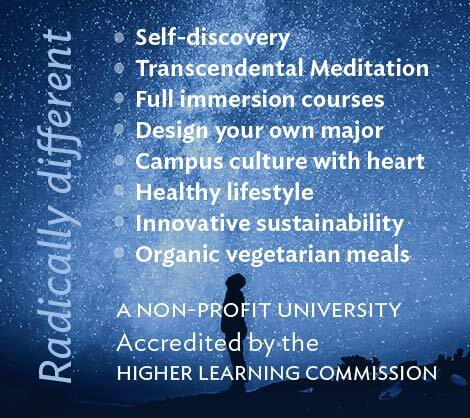 By studying the theoretical and practical aspects of Maharishi Vedic Management, including the Transcendental Meditation program, students personally grow in better health, clearer thinking, greater creativity, moral development, and wisdom. 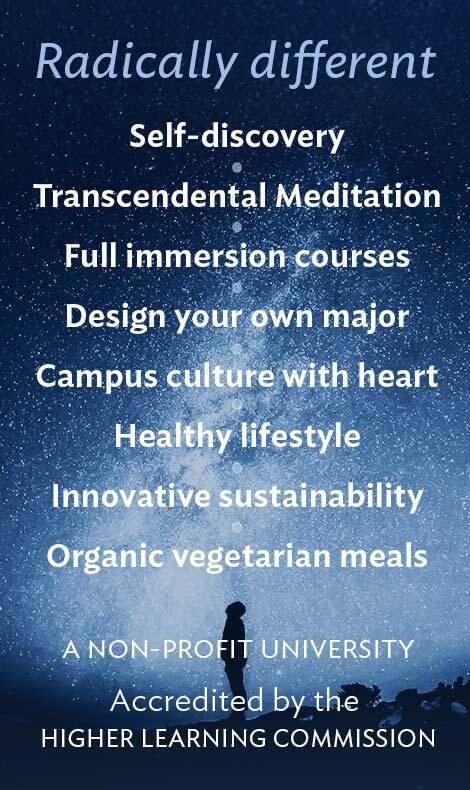 They integrate the study of contemporary developments in the discipline with the practice of the Transcendental Meditation program, and the principles that underlie the structure and function of the world around them. Research has shown that a natural result of the practice of the Transcendental Meditation technique is an appreciation of one’s environment and more harmonious interpersonal relationships. As a result, students in the business department naturally have a broadened awareness of their place in the world and understand the importance of making a positive, sustainable contribution to society.